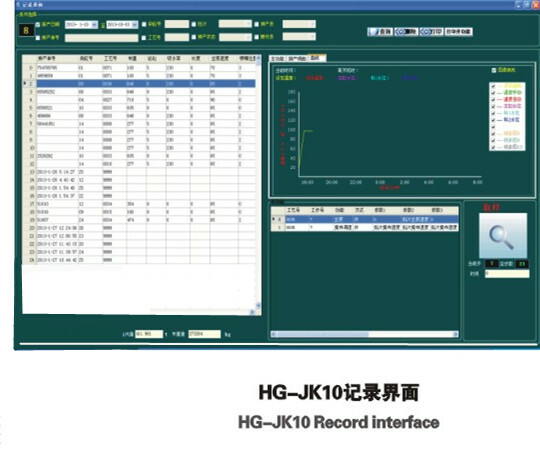 Through monitoring on a number of computers, the HG-JK10 dyeing machine central monitoring and management system can fully control the dyeing process, record the data of the whole dyeing process, greatly reducing the dyelot chromatism and the chromatic aberration caused by human factors in the dyeing process; and it can prevent the quality accidents caused by the equipment faults, to facilitate the production management greatly including product quality analysis production statistical report forms, customer data management, etc. In order to reduce the cost of manufacturers and facilitate the operations in the site, the dyeing machine central monitoring and management system can adopt another method. All computers of dyeing machines are placed in the dyeing site and connected through a double-twisted shielded communication line (multiple way and multi-interface access for more machines). Only one IPC computer in the central control room can monitor the operations of dying machines in the production site, which does not require centralized control cabinet nor investment for the cables and wires, saving the costs. 1. One industrial control machine is used to monitor 100 dyeing machine computers. It can achieve programming, save the uploaded and downloaded process data, and monitor and record the status of dyeing machines and the technological process; by checking and printing the process curve, data and statistical forms, it facilitate the analysis of dyeing quality and production management greatly. 2. Real-time monitoring of dyeing machine status and technological process can detect abnormality of some equipment and the working conditions. It will give alarms to remind staffs to take effective measures, greatly improving the ability of preventing the dying quality accidents. 3. The dyeing machine central monitoring and management system can not only monitor the dyeing process, the speed control and the temperature holding time, but also can accurately monitor the liquor ratio that may affect the dyeing quality and assure the dyeing quality. 4. The standardized management of the dyeing process can enhance the process confidentiality, and avoid unnecessary human accidents. 5. Increase the service life of dyeing machine control computers and improve the stability of the computer. 1. 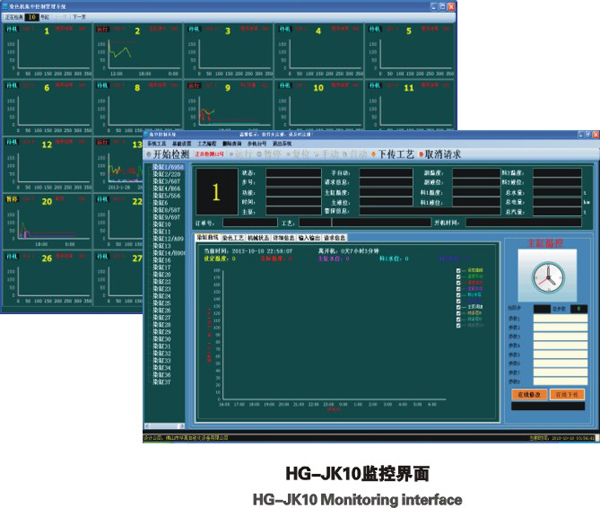 The central monitoring and management system is connected with the ERP management system, or ordinary production management system, and the production orders can be imported by the production management system, which needs not enter in the central monitoring and management system again, increasing the production and management efficiency. 2. The central monitoring and management system can achieve unmanned operation; and the lower computer in the dyeing production site can directly send the automatic request signals, and the central monitoring and management system will transfer the production process to the lower computer. The operation process can be directly operated in the lower computer, or suspended or operated, but it cannot reset or operate in another process procedure. Such flexible automatic control ways make the operations more convenient and practical. Nobody is required to arrange to take charge of the central monitoring and management system. 3. Each production order covers the contents such as production process download time, preparation time, starting time, process time computing and the ending time. 4. 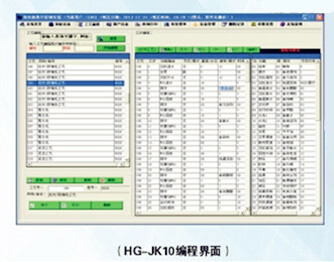 Online centralized control: A management system can be installed in other offices such as general manager’s office, which has almost the same operating interface as the central monitoring system, and through the system, we can check all status, progress and production records of the lower computer in the dyeing production site (depending on customers’ needs). 5. 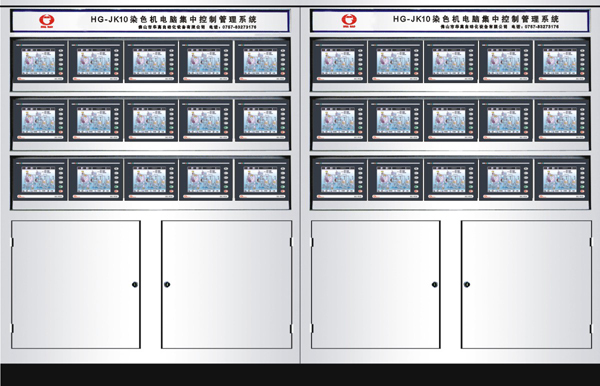 The central monitoring and management system can be connected with the production scheduling management subsystem network developed by the company (depending on customers’ needs). It can monitor the real-time status of 100 dyeing machines simultaneously; provide the curve group and the single machine flow chart display mode, to detail various states and parameters of various dyeing vats. The number of programmable processes is not restricted, and 200 programmed steps can be achieved for each process. The programming method is very simple. The programming process is visible, with detailed help interfaces. Just input the codes in each step. The process interface is very clear, and it can estimate the time required for the process operation and intuitively display the number of times of each feeding process. 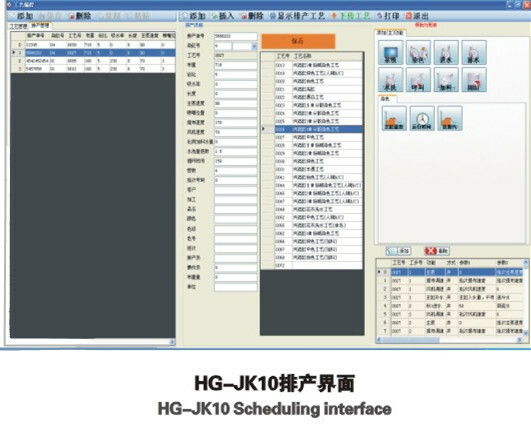 The scheduling order can be automatically generated according to the vat number, order number, cloth weight and liquor ratio, water absorption rate and process number parameters, which can be connected to the ERP system to automatically input the scheduling order. The completed process, process download time, preparation time, starting time, process time and the ending time can be checked at any time according to the vat number, order number and time, etc. ; in addition, such information as the specific time of each step, master cylinder water level curve, vat water level curve can be checked during process operation.